When Wonder Woman is not saving the day, she's dressed in her off-duty look and ready for all kinds of fun! This 12-inch Wonder Woman doll is dressed in a Star patterned blue mini skirt, matching red sneakers, and tiara. She can stand on her own and is articulated for powerful posing and action adventures! Starfire Fashion Transformation doll has twice the look in just one doll. The doll wears an outfit that easily transforms from schoolgirl into super hero ready for all-new action-Packed adventures! She comes decked out in her signature colors with iconic accessories and a backpack. Boys and girls ages 4 to 6 will love this Step into Reading leveled reader featuring Wonder Woman as she teams up with her Super Hero High classmates Supergirl™ and Miss Martian™ for an awesome adventure in outer space. The heroes’ school trip to a space station to meet with other students from around the galaxy turns into a rescue mission when a meteor shower hits! Can the heroes save the day? The included full-color collector cards add to the fun! Join Wonder Woman, Supergirl and Batgirl along with fellow gal pals Poison Ivy, Harley Quinn, Bumblebee and Katana. Enrolled at the esteemed Super Hero High, the teens in training practice their unique abilities and master the fundamentals of becoming super heroes. As the students compete for the annual Hero of the Year prize, the ominous Dark Opal and his mysterious partner-in-crime target the girls and the school in their plot to rule the universe. 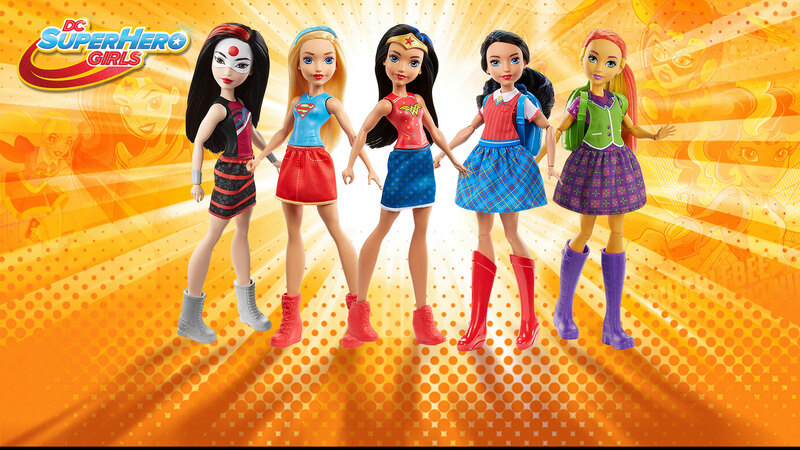 Join the DC Super Hero Girls as they discover that the real power lies within each and every one of us! When DC Super hero girls aren’t saving the day, they’re dressed in their off-duty look and ready for all-new fun adventures. This 12" Katana doll is dressed out in a black with red striped mini skirt, silvery boots, and matching cuff bracelets. This doll can stand on its own and is articulated for powerful posing and action adventures. Supergirl Fashion Transformation doll has twice the look in just one doll. The doll wears an outfit that easily transforms from school girl into super hero, ready for all-new action-packed adventures. This doll is fully articulated for powerful posing and creative storytelling. She comes in her signature colors with a backpack with hidden cape inside. When the world’s honey supply starts to drop and some of her old tech disappears, super student Bumblebee enlists her friends Wonder Woman, Batgirl, Poison Ivy, and Beast Boy to help her find out why. Is it a new villain, or someone from the past? With so much going on at Super Hero High, Bumblebee isn’t sure how she’s going to keep an eye on everything, but she’s determined to do it with style . . . and sting! Things are going swimmingly for new students Mera and Raven, until the girls go on a field trip to Mera's hometown of Atlantis and find that the underwater city has vanished! Batgirl, Supergirl, Wonder Woman, Bumblebee, Raven, Miss Martian and Starfire discover that Atlantis has been shrunk and bottled by the powerful villain Brainiac! This gigantic problem calls for a small solution. To infiltrate Brainiac's bottled-city collection, Bumblebee and Raven combine technology with magic and shrink the heroes. But will they save the lost city of Atlantis, or will their little plan lead to even bigger trouble? Wonder Woman, Batgirl, Bumblebee and Katana face the King Shark in a battle for the high seas. Can Katana overcome her fear of deep water to save the day? Find out in this action-packed book that also features over 30 stickers and trading cards of your favorite DC Super Hero Girls. Rivalries heat up for the LEGO® DC Super Girls. Touting the promise of ‘less homework, more fun,’ Uber High is on the rise and when members of Super Hero High begin leaving to join the mysterious new school, Wonder Woman, Supergirl and Batgirl are on the case! Newly enrolled Uber High students Catwoman, Cheetah and Poison Ivy welcome the change of the new school that lets “you be you”, but is Uber High’s curriculum legitimate or are the girls being used for a darker purpose? It’s up to the Super Hero High girls– including a new Green Lantern – to uncover the truth about Uber High. This test is one that the LEGO DC Super Hero Girls cannot fail! When Supergirl doll isn't saving the day, she's dressed in her off-duty look and ready for all kinds of fun! This 12-inch Supergirl doll is dressed in a red mini skirt, matching red sneakers and a headband. This doll can stand on its own and is articulated for powerful posing and action adventures. This doll wears an outfit that easily "transforms" from school girl into Super hero, ready for all-new action-packed adventures. This doll is fully articulated for lots of powerful posing and creative storytelling. She comes decked out in her signature colors with iconic accessories and a backpack. Harley Quinn investigates a high-tech carnival in this action-packed new DC Super Hero Girl novel! Funny girl Harley Quinn loves fighting crime with her classmates like Wonder Woman, Batgirl, and Supergirl, but she always does it her with own madcap style–and a big mallet! It’s no surprise that Harley can’t resist getting involved in a dance competition and organizing an outrageous battle of the bands. But when a high-tech carnival comes to town, Harley knows that things aren’t what they seem and that only she can get to the bottom of the mystery–and deliver a great punch line while doing it! Super Hero High is out for summer, which means Wonder Woman has to take her annual trip to visit her dad, Zeus, and this time she's bringing a few of her super-friends along. When the girls arrive at Olympus, it's not long before the family reunion devolves into a family competition and the gods offer Wonder Woman the ability to become "full goddess" to increase her powers, but at the cost of renouncing her life at Super Hero High. Will Wonder Woman refuse the offer? And if she does, might this mean war on Super Hero High? Meet WONDER WOMAN™, SUPERGIRL™, BATGIRL™, and all the other DC Super Hero Girls™ in this book with animated cover! At Super Hero High, the galaxy’s most powerful teens develop their powers and learn what it means to be a hero. Meet Wonder Woman, Supergirl, Batgirl, and all the other DC Super Hero Girls in this information-packed book that will introduce young fans to their favorite super heroes—especially those who have earned the biggest honor: the Hero of the Month award! Dive deep into adventure with the DC Super Hero Girls in this an underwater epic. Sisters of the sea, Siren and Mera catch the students of Super Hero High off guard in a surprise attack to steal a very powerful relic – the Book of Legends. With the book in her possession and harnessing more power than ever, Siren aims to raise an army from the depths of the ocean’s trenches. It’s up to Wonder Woman, Batgirl and Supergirl to help Aquaman in defending Atlantis and stop the sinister Siren! Get ready for a thrilling adventure featuring the DC Super Hero Girls! Batgirl has always hidden in the shadows—but does she have what it takes to stand in the spotlight at Super Hero High? Barbara Gordon has always been an off-the-charts, just-forget-about-the-test super-genius and tech whiz, and then she gets the offer of a lifetime when Supergirl recognizes that Barbara’s talents make her an ideal candidate for Super Hero High. Donning the cape and cowl, Barbara Gordon becomes Batgirl, ready to train at the most elite school on the planet, next to some of the most powerful teenagers in the galaxy. She’s always had the heart of a hero... but now she’ll have to prove that she can be one. Good thing she loves a challenge! Harley Quinn is center stage in the newest volume of the DC Super Hero Girls graphic novel series, DC SUPER HERO GIRLS VOL. 5: OUT OF THE BOTTLE! For an assignment in Ms. June Moone's art class, the girls are working on their very own comic books. The character-created comic pages give us a glimpse into each girl's personality. But Harley isn't satisfied with her comics creation and thinks a little of Ms. Moone's special paint will really help her drawings come to life! The problem? Harley's drawings literally come to life! An over-the-top pop quiz puts Ms. Martian’s ability to turn invisible to the test. Luckily, she’s got Wonder Woman, Supergirl, and the other DC Super Hero Girls to help her save the day. Glow-in-the-dark pages reveal clues and help young readers spot Ms. Martian. A glow-in-the-dark wall poster featuring Wonder Woman, Supergirl, and the other DC Super Hero Girls adds to the fun! In addition to training to be a super hero, Katana also follows the noble warrior traditions of the Samurai. Now a mysterious presence has given her the responsibility of guarding a hundred ancient Samurai swords—but why her, and for what purpose? With the help of Wonder Woman, Supergirl, Ms. Martian, and some of her other super friends, she intends to find out. But she just made captain of the fencing team, she has a huge school project due, and a villain with ties to her family’s past seems to be amassing an army. Maintaining her inner peace isn’t going to be easy . . . but Katana has the steel to save the day! Prepping for high school finals is hard enough, but at DC Super Hero High, even the tests are super-tough! Supergirl, Bumblebee, Wonder Woman, Batgirl, Harley Quinn, Katana and Poison Ivy are studying hard when they are trapped by a mysterious villain! Will the students outsmart their captor, save Metropolis, and still pass their finals? Something is up at Super Hero High, and WONDER WOMAN™, SUPERGIRL™, BATGIRL™, and the other DC Super Hero Girls™ are on the case in this Pictureback storybook—with bonus stickers and collector cards! Wonder Woman’s shield, Supergirl’s cape, Batgirl’s utility belt, and other items are disappearing from Super Hero High—the school for the most powerful teens in the galaxy. The heroes go on the hunt to figure out who—or what—is making off with their hero gear in this action-packed book for young readers! Full-color collector cards and stickers add to the adventure! Facing off against Korguar Academy and the Female Furies, can the Super Hero High team bring home the championship? Let the games and the action begin! Wonder Woman isn’t like most high school students—but Super Hero High isn’t like most high schools! Wonder Woman is an Amazon Warrior and Princess. She has never left her home on Paradise Island. But she wants to be a super hero—the very best super hero she can be. In order to train at the most elite school in the galaxy, she has to juggle acing her classes, forging new friendships, trying to make the team for the Super Hero Super Triathlon, and her insane suite-mate sharing her every embarrassing moment on social media. Not to mention . . . Wonder Woman has never seen a boy before. High school is going to be harder than she thought. Wonder Woman, Batgirl, and Bumblebee have to stop Killer Moth from bug-napping beautiful space butterflies that only visit Earth once every hundred years. Can the heroes net the villain before he flies off with these amazing creatures? Find out in this action-packed leveled reader!